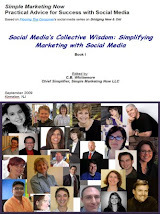 A Weblog and Newsroom for Simple Marketing Now LLC, a marketing communications consultancy focused on simplifying customer interactions with social media and content marketing. If you'd like to read our blog content in real time, visit Simple Marketing Now directly and consider subscribing to Content Talks Business. 64/365 Ignorance originally uploaded by mellyjean. I hear it a lot. "All that social media stuff, it's not relevant to me. I can ignore it." I have news: you can no longer ignore social media. Particularly if you are in any way involved in marketing or selling a brand, product or service. Because our customers are online, researching, reading reviews, exchanging opinions and making purchase consideration decisions based on whether they find you and what they discover about you. They are in control. They can uncover the good, the bad and the ugly about you. And, if you aren't participating, you may not like the consequences and may not be able to react as Domino's Pizza did [reg'n req'd]. You see, your brand is not your own. It really never was. Even more so now. Did you by any chance catch the 4/13/09 AdAge article titled 'Lever's CMO Throws Down the Social Media Gauntlet' [registration required]? It's an interesting call to action. The article starts out with "brands aren't simply brands anymore. They are the center of a maelstrom of social and political dialogue made possible by digital media." Now, you may fear this sea change. But, I assure you it is happening and ignoring it will not make it go away. If you pull off the blinders, peel away the fingers from your eyes and begin exploring what it is all about, I think you will be pleasantly surprised by what you discover. As Lever's Clift states "brands are now becoming conversation factors" and leading the way to "marketing programs with social benefits." I'd say that represents an amazingly powerful way to create loyal customer relationships. "Listening to consumers is more important than talking at them." "You can't hide the corporation behind the brand anymore -- or even fully separate the two." "PR is a primary concern for every CMO and brand manager." "Cause marketing isn't about philanthropy, it's about 'enlightened self-interest.'" "Social media is not a strategy. You need to understand it, and you'll need to deploy it as a tactic." Read the entire 5 rules. Cut them out and place them somewhere where you will see them and internalize them. Oh, and if you think of any others to add to the list, would you let me know? While on the subject of listening, Internet Retailer says in its 2/9/09 article titled "Companies fail to measure and act on customer feedback, study finds" that the majority of companies have no established programs for listening [i.e., 'monitoring and measuring'] to customers. This is based on a CMO Council study - "Giving Customer Voice More Volume" and I encourage you to read the official summary. At the same time, eMarketer says that Marketers Need Metrics to Integrate Traditional and Digital Media. The article concludes that the best solution is becoming as savvy as possible about new media, setting goals and business objectives, understanding customers, testing and paying attention to analytics. Step back and think on your existing customer interactions. Are you listening? How do you listen? Are you doing something about what you hear? Are you using some of the free and easy-to-use tools available? I'm talking Google alerts for your brand and company names. If you aren't, why not? They are your first line of defense. Next, check out Search.Twitter. Start exploring the digital world, as Lever's Clift urges, and listening to customers, then worry about whether you have the right metrics available. I may be simplifying, but chances are you may have everything you need. It's just the lack of a social digital framework that prevented you from interpreting it all. + Blogs are now mainstream media. Questions About Social Media Marketing? What About The Consumer of the Future? In-house SEO Vs SEO Outsourcing – What Is The Best For You? Will Apple’s Brand Extend Into Services Successfully? Diva Foodies - My Newest (Ad)Venture! Are Your Customers Satisfied With Your Business? Really?